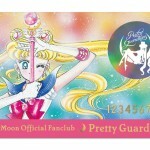 Pre-orders for membership in the Official Sailor Moon Fan Club are open to international users until June 30th, Usagi’s birthday. Fans can order their membership from the Tokyo Otaku Mode web site. As in past years this includes a membership card, special gift and, for those who were members previously, a renewing membership benefit. 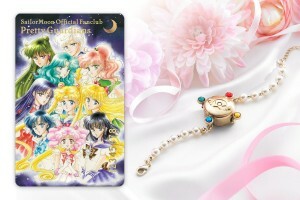 The special gift is a “Sailor Moon Communicator Watch” which is based off of Usagi’s communicator in the manga which we also saw in Sailor Moon Crystal. Usagi had a much different kind of communicator watch in the original Sailor Moon anime’s Sailor Moon R season though she had a calculator like PDA in the first season. In the live action series Usagi uses a magic cell phone to communicate with her friends. 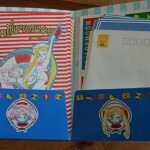 The renewing membership benefit is a “Sailor Moon Princess briefcase” and “Sailor Princess notebook”. Not sure what’s princessey about these. The briefcase isn’t really anything like what I think of when I hear briefcase. It’s more like a folder for holding paper or, in this case, a notebook! 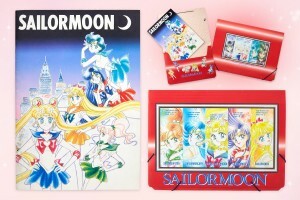 Both items feature manga art by Naoko Takeuchi. Neither feature images of Princess Serenity or any other characters in Princess form. The art on the membership card is fairly underwhelming. This is art we’ve already seen on the special book and 25th Anniversary Tribute Album. This is fairly new art by Naoko Takeuchi so I suppose it decently encompasses the current feel of the franchise. I’m a bit on the fence about renewing my membership. The idea of the Fan Club is sound, that you sign up and get a special gift and have the chance to get a bunch of exclusive merchandise. That said I haven’t found many of the fan club exclusive offerings terribly compelling. 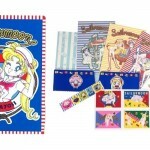 With such a massive amount of Sailor Moon merchandise being sold in Japan over the last few years I hardly feel like I need to buy more but rather pass up a lot of items. The only fan club exclusive I’ve gotten in the past 2 years is the stamp set, which I was quite happy with. A lot of the benefits for Japanese fan club members, like access to items only for sale in Asia or events in Japan, aren’t applicable to international members. Some fans choose to get a Japanese fan club membership though again for fans outside of Japan a lot of those benefits, such as for events held in Japan, aren’t something they can make much use of! Are you a fan club member? Do you plan on renewing your membership? What advantages has membership in the fan club gotten you? This entry was posted in Merchandise, Sailor Moon Manga and tagged Communicator Watch, Naoko Takeuchi, Official Sailor Moon Fan Club by Adam. Bookmark the permalink. For the most part it’s a waste of money as the only thing I ever get is the gift with membership because the fan exclusive items that I would want are not offered to those in the US or Canada. The watch looks nice, just not worth it for me. Is there an extra charge for them to ship the membership card and the gift? I’m considering it this year as I sadly kept forgetting to get the membership for the last two years.